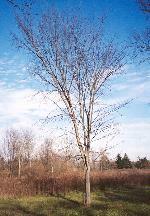 The photographs on this page show an assortment of American elm cultivars and unselected American elms at various stages of relatively mature growth. 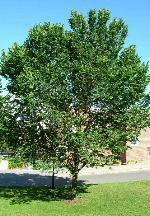 Many of these photographs were taken in November, 2002 by Mike Shade of Botany Shop Garden Center in Joplin, Missouri. (Thanks for your contribution, Mike.) 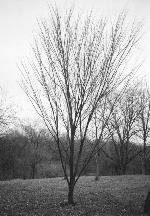 Smaller saplings of the Valley Forge and New Harmony varieties are depicted in my Elm Sapling Gallery and in my Elm Sapling Gallery, page 2. 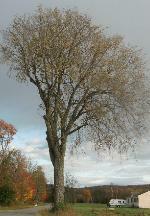 The pictorial tour of mature elms at Dartmouth College (someone else's work) also might be worth exploring. Click any picture to view the full-size version. 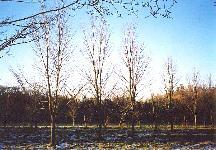 The two photographs on the left are Valley Forge elms, about 20 years old and about 34 ft. tall, located in a test plot in Delaware, Ohio. 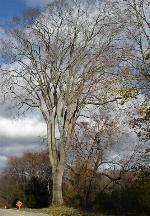 The two on the right are Princeton elms, about 20 ft. tall, located at the Arnold Arboretum, Jamaica Plain, MA. Photographs by Mike Shade. 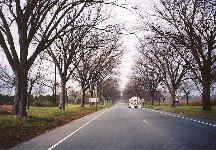 The left and middle photographs depict mature Princeton elms along Washington Road, Princeton, NJ, planted in 1932. 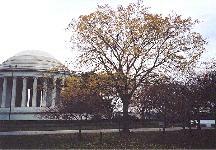 The tree on the right is a mature American elm of the variety, "Washington," located at the Jefferson Memorial, Washington, DC. Photographs by Mike Shade. 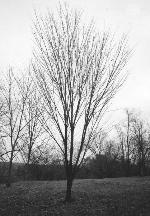 The left and middle photographs depict New Harmony elms, each about 25 ft. tall, located in a test plot in Delaware, Ohio. 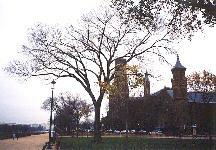 The tree on the right is a mature American elm of the variety, "Jefferson," located at the old Smithsonian building in Washington, DC. Photographs by Mike Shade. 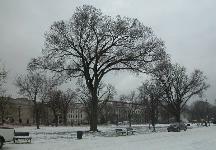 These two photographs each depict a mature American elm of the variety, "Jefferson," (about 70 years old, about 50 ft. tall), located at the old Smithsonian building in Washington, DC. 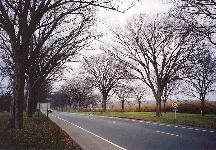 Photographs by S.E. 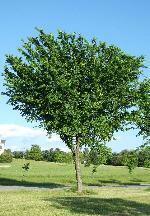 Bentz, U.S. National Arboretum. 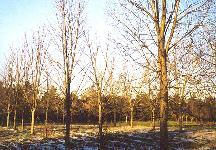 American Liberty elms on private property, about 15-20 years old, probably representing clones W-502, W-507, M-8, and W-505 respectively from left to right. Photographs by Joe Pickens. 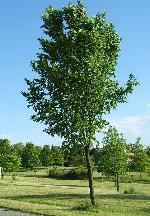 Warning about Liberty elms! 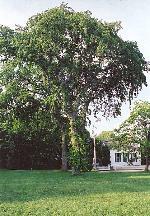 American Liberty elms on private property, about 15-20 years old. 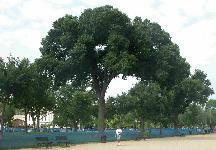 The tree on the left has been pruned well; the other has been left to its own devices. Photographs by Aaron Helfand. 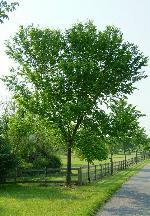 Warning about Liberty elms! 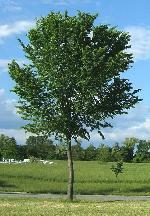 Mature American elms in the northeastern U.S. 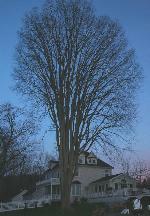 The center-left tree is a Princeton elm of unknown age, located in Littleton, MA. Photographs by Todd Carley (left three) and Roy Najecki (far right). 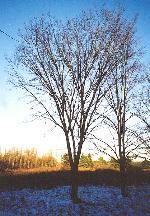 Mature American elms in the northeastern U.S. Photographs by Gilbert Carley (left and center), and Catherine H. Clark (right). 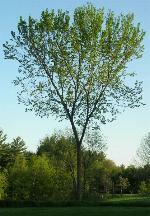 Mature American elms in the northeastern U.S. Photographs by Heather Pastore (left), and Randy Jorgensen (right).